GRWR: Were there a lot of Contraband Camps for escaped southern slaves and where were most of them located? VanHecke: Yes, there were many contraband camps. Butler’s landmark decision became law with passage of the Confiscation Acts of 1861 and 1862, opening the floodgates for runaways all over to seek contraband status behind Union lines. More than a hundred contraband camps sprang up throughout the South, as far north as Washington, DC. GRWR: I saw your bibliography in the back matter and wondered how long it took to get all your research done? Were there any discoveries you made while researching the book that surprised you or shed new light on the subject? I researched for a couple of years. I couldn’t find a whole lot of well-sourced information when I started. Serendipitously, though, it was around that time that great attention was being focused on Fort Monroe, where the contraband slave story began. The historic fortress had been decommissioned as an Army installation and there was much hue and cry about if and how it could be preserved. Among its staunchest supporters was Civil War scholar Dr. Adam Goodheart, author of the bestseller for adults 1861: The Civil War Awakening. He had done extensive research into the contraband slave story, and his book and sources were a great springboard for my project. I’m so honored that he agreed to vet Under the Freedom Tree for accuracy (and I’m so pleased Fort Monroe became a National Monument, now part of the National Park Service). I think the most intriguing discovery I made while researching was the surprising full circle of slavery’s start and end. I learned it was in the waters off Fort Monroe—those same waters Frank, James, and Shepard rowed to their eventual freedom in 1861—that the first Africans were brought to the English colonies for the purpose of slavery in 1619. I like to imagine that the Freedom Tree was just a newly sprouted acorn then, growing to bear witness to the slaves’ determined, ultimately triumphant fight for liberty. 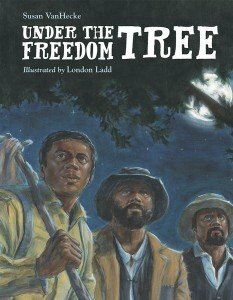 GRWR: What part of Frank, James and Shepard’s struggle touched you the most when writing Under The Freedom Tree? 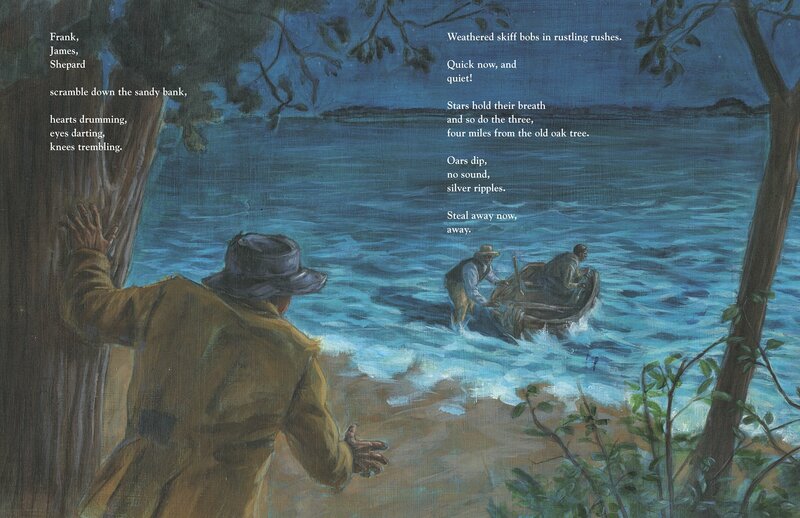 VanHecke: When the book’s illustrator, London Ladd, traveled to my area to research, we visited the exact location where Frank, James, and Shepard climbed into that stolen rowboat. It was a windy day, and the waters were dangerously choppy. Though the trees on the horizon were about two and a half miles away, they seemed like they stood on the other side of the world. London and I could hardly imagine the courage it must’ve taken to embark on that nighttime journey, not knowing if you’d make it across the water, and more importantly, not knowing what would happen to you when you got to the other side. That took pure grit—and a whole lot of hope and faith. GRWR: Have you been to Hampton to see the Emancipation Oak and if so, what did it feel like seeing such an important symbol in Black History? VanHecke: Emancipation Oak still stands at the entrance of Hampton University, an impressive tree that’s open to the public. It’s easy to see why the National Geographic Society named it one of its Ten Great Trees of the World. It’s pure magic to stand under the oak and imagine all it’s seen over four centuries. If you’re not able to visit the tree in person, the video here, http://underthefreedomtree.com/video.html, will give you some idea of what it’s like. GRWR: You and London actually met which is SO unusual in publishing. Most common is the manuscript gets written first and then the illustrator is chosen with no collaboration. How were you two fortunate enough to be able to spend time together? VanHecke: It is definitely unusual! I was thrilled when I learned London would be illustrating the book, but I was doubly thrilled when he decided to travel from Syracuse, New York—where he lives—to southeastern Virginia—where I live and where the events in the book took place—to research his illustrations. He’s passionate about his work, and he wanted to make sure he got all the details just right. London visited Fort Monroe and Emancipation Oak, and together we visited Sewell’s Point, where the three slaves pushed off in the rowboat as they made their escape. I also took London to some area wetlands so he could get a better idea of how the shore might’ve looked in 1861, since Sewell’s Point is now part of Norfolk Naval Base, the largest naval station in the world. GRWR: What would you like readers to take away from reading Under The Freedom Tree? VanHecke: I hope readers will come away with a fresh, new view of the journey to emancipation. The “classic” version of passive slaves liberated by the kindness of the white man is outdated, unfair, and untrue. As the contraband story shows, African Americans were proactive and tireless in pursuing their own freedom in whatever ways they could—be it taking it upon themselves to make the dangerous trek to the Union line, laboring for and ultimately joining the Union forces in the war effort, or teaching themselves to read and write. They quite literally put their lives on the line. I also hope young readers will see in Under The Freedom Tree the importance of standing up for what’s right, even if it’s against the law. Frank, James, and Shepard did this by escaping their oppressors. Butler did this with his contraband slave decision. Mary Peake did this by teaching contrabands under the Freedom Tree. And they changed the course of history, ensuring liberty for all in this country. 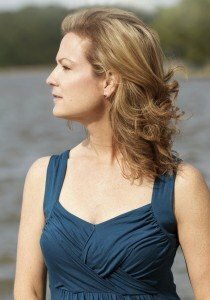 You can learn more about the people, places, and events in Under The Freedom Tree at the book’s website, www.underthefreedomtree.com. NOTE: Look out for VanHecke’s next book from Charlesbridge, a picture book biography of Mexican bandleader and stereo sound pioneer Esquivel. Visit these other bloggers on the tour to find out more!